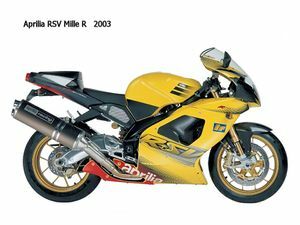 I recently covered around 3,500 kilometres aboard an Aprilia RSV 1000 Mille and formed quite a bond with the Latin lovely during that time. The Aprilia felt very high at first. With a seating position that made me feel as though I was sat on top of the bike rather than part of it. This left me feeling a little disconnected with what the bike was doing and it took me a little while to trust the package, particularly the front end. 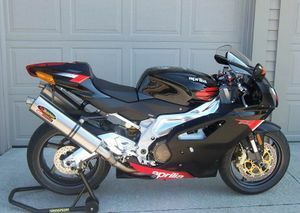 However, once I started giving the bike it's head I was rewarded with excellent performance. Suspension is a little on the stiff side but the initial part of the stroke is supple enough to absorb all but the biggest of hits. 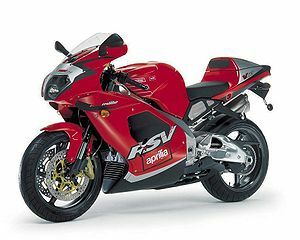 Stability is quite good but I feel that, like Honda's SP1, the Aprilia may benefit from a some minor suspension mods to the valving. 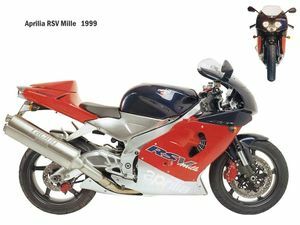 I have found this in all the V-Twin sportsbikes I have ridden so the Mille is definitely not alone in this department. The engine is extremely well engineered with little of the trademark shudders and shakes that are normally associated with V-Twin motorcycles. 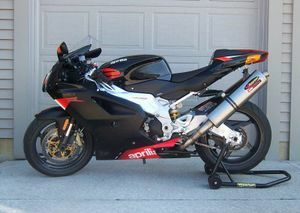 If Aprilia can do this why can't the rest? Bottom end pull is excellent and builds into a very strong mid-range. It does suffer a little at the top end compared to the 4-cylinder opposition but so do all V-Twins. On a run through some of the mountain roads Southern New South Wales has to offer, fellow riders following me commented that large black lines were peeling out from behind the rear tyre on the Aprilia when exiting the corners, can't complain about that much drive! Braking is typical Brembo, a bit more effort through the lever than most but plenty of power when pulling the lever hard. Feel seems to be a little wooden at first but I had no trouble performing some excellent rolling stoppies for the camera so it can't be all that bad! Practicality is excellent with my Aprilia experience being completely fuss free, fire her up in the morning and off you go with no complaints. The headlight is excellent. I rode the RSV around 200 kilometres during the night and found the headlight to be unequalled in my experience, the high beam is wide and penetrating. Fuel range is ample, with the 20 litre tank giving a touring range of well over 300 kilometres at legal touring speeds. The dash layout is complex enough to confuse a 747 pilot. A large digital speedo sits to the left of the conventional round tachometer which features a flashing shift light. 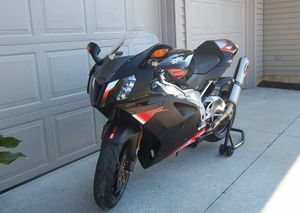 The RSV is the easiest sportsbike I have ever ridden to keep to the speed limit. I don’t know what it is, maybe it is the aid of the large LCD speedo, but in 60 and 70 zones I found myself doing pretty much the exact limit and sitting there quite happily. This in itself maybe a reflection on how pleasurable and comfortable the bike is to ride. The dash records your highest top speed since you last pressed the reset button. It also has the facility to store up to 40 lap times that you set by pressing the headlight flash switch each time you go over your chosen start/ finish line. A clock, fuel light, side stand light and temperature gauge are also easily read. Strapping luggage to the Mille is a bit of a hassle. A lack of good tie down points make things harder than it should be. A tank bag sits reasonably well on the fuel tank but if you need to carry more gear than that, a backpack and/or some sort of luggage rack will have to be fitted to the Aprilia. That aside, many kilometres can be ridden with a minimum of fatigue, as the Mille is an extremely comfortable mount. This bike turns heads. 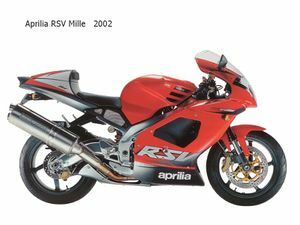 At various times during my time with the Mille I parked the bike next to various other high-end sports models but passers-by would always comment on the attractiveness of the Aprilia. 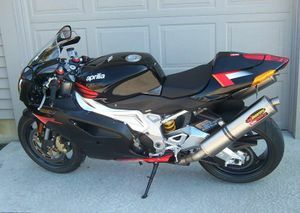 If I was in the market for a big V-Twin I think the Aprilia would probably be at the top of my shopping list. This page was last edited on 1 February 2011, at 18:30.